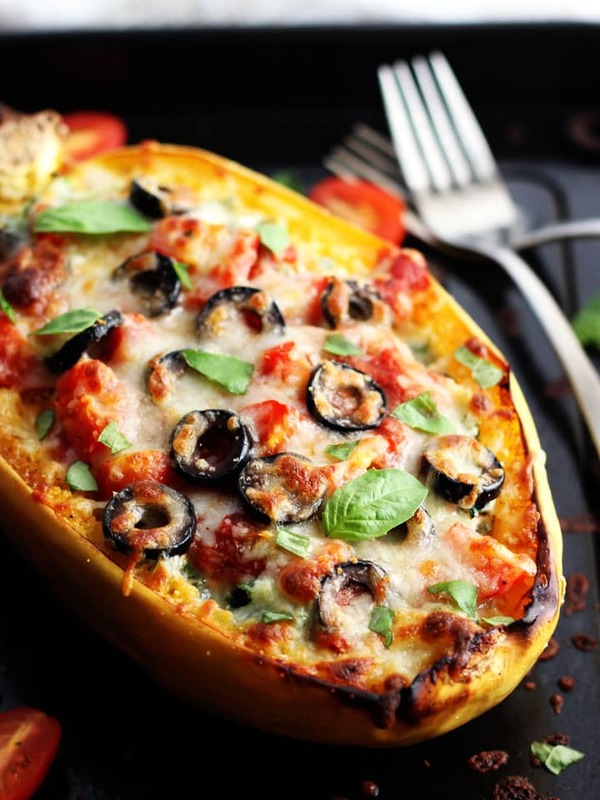 Veggie Pizza Spaghetti Squash Boats are ricotta and kale stuffed toaster oven-roasted spaghetti squash covered in your favorite vegetarian pizza toppings. Serious comfort food that’s secretly wholesome. Sorry guys, we’ve been holding out on you. Even though we’ve been making these cheesy veggie boats for years, it never occurred to me we should add them to the site. I guess it’s because they’re more of a clean out the fridge, grab all your favorite veggies and toss them with cheese situation. Until last week, I’d never measured the ingredients or followed a recipe just like with this Roasted Baby Potatoes and Chickpea Salad. But we’ve heard your requests for simple toaster oven meal ideas. With bold yet familiar flavors, quality proteins, healthy fats and lots of vegetables. 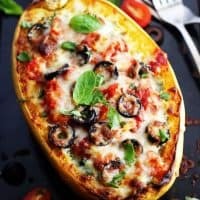 So last week, after taking new photos for our Ultimate Guide to Toaster Oven Spaghetti Squash I took myself off autopilot and wrote down a basic recipe for these veggie pizza spaghetti squash boats. Instead, use whatever ingredients you have on hand and change the flavors to fit your desires. Don’t have pizza sauce? Substitute marinara or a spaghetti sauce that’s already open. Craving Mexican food? Use enchilada sauce or salsa. Add bell peppers, onions and black beans. Top them with avocado and sour cream. Now, if all this cheese is looking too heavy and rich, we’ve got a tip. The secret to making your delectable overstuffed bowls feel decadent but lighter is…Fresh Herbs. 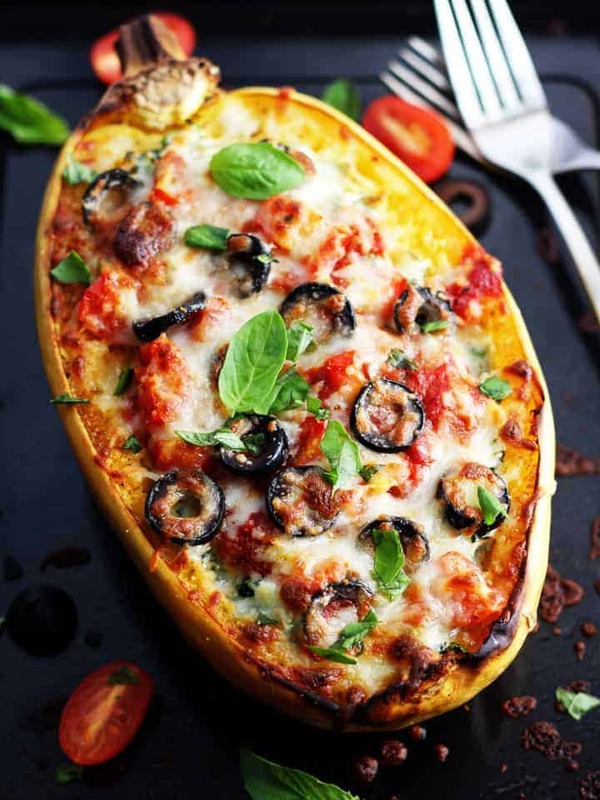 Sweet and peppery basil with its unmistakable fresh aroma will make your already fantastic veggie pizza spaghetti squash boats taste Ah-mazing! 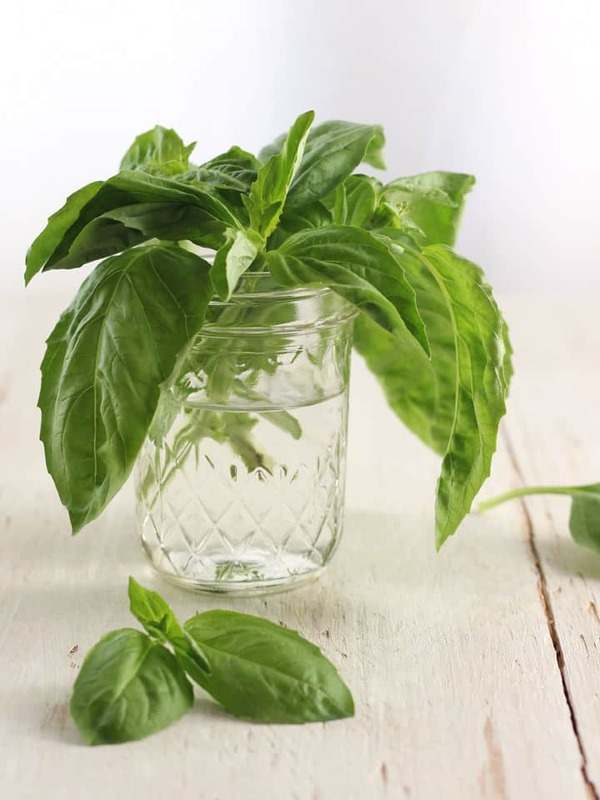 Have you ever purchased fresh basil, tossed it in the fridge and were greeted with a wilted mess the next day? The answer was this unbelievably useful article from Serious Eats. According to the article, you’re sentencing basil to a limp death by storing it in the fridge. If you’re a serial herb murderer like I used to be, check out the directions for storing other herbs like cilantro, parsley and mint. They work fantastically and you’ll always have fresh herbs ready to top your personalized veggie spaghetti squash boat creations. Preheat the toaster oven to 425F and grease your toaster oven's baking sheet. Use a sharp knife to stab the squash a few times all over and microwave* for 5 to 6 minutes on high until a knife easily slides into it. Slice open the squash lengthwise and scoop out the seeds. Drizzle each half with oil and sprinkle with salt and pepper. Place squash onto the prepared baking sheet with the insides facing down. Roast until soft and tender, about 30 to 40 minutes depending on the size of your spaghetti squash. Remove squash, flip over and cool for 5 minutes. Leave toaster oven on but reduce temperature to 350F. While the squash cools mix together the ricotta, kale, basil and Italian seasoning. Carefully, scrape the squash into strands with a fork leaving the skin intact. Divide ricotta equally among squash bowls and mix with squash. Spread pizza sauce over each bowl and top with tomatoes and olives. Sprinkle with mozzarella. Return squashes to the toaster oven and bake uncovered for 10 minutes to warm the ingredients. Turn on the broiler and broil for 2-3 minutes until the cheese is bubbly and browned. Store leftover boats in a covered container in the fridge for 2-3 days. To reheat bake at 350F for 25-30 minutes until warmed through and the cheese is melted. 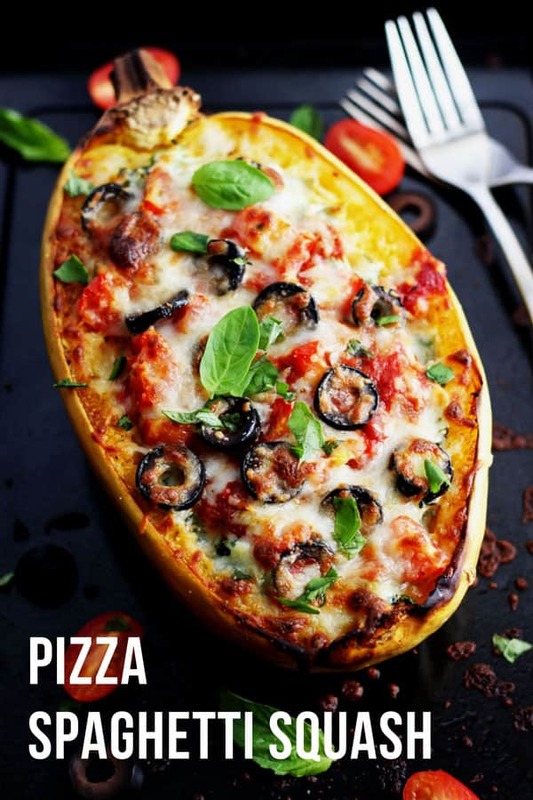 Nutritional Information is an estimate for 1 of 2 Veggie Pizza Spaghetti Squash Boats. « Can You Melt Chocolate In A Toaster Oven? I love clean out the fridge recipes! They make me feel so virtous, not wasting and so on… 🙂 And they turn out so great most of the times. 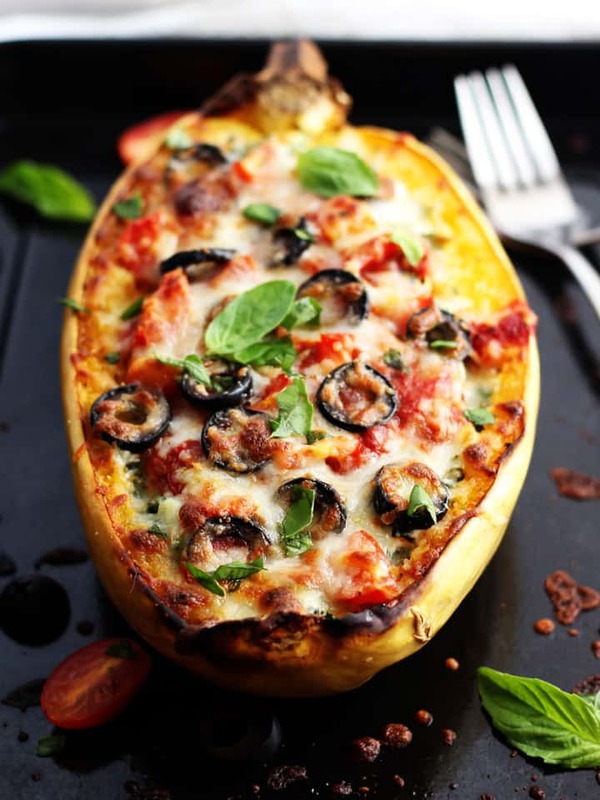 I love this idea, I will give it a try if I manage to find another spaghetti squash this winter. I wish you happy holidays and a Merry Christmas! Thank you, friend 🙂 Happy holidays and best wishes for a fantastic 2017!